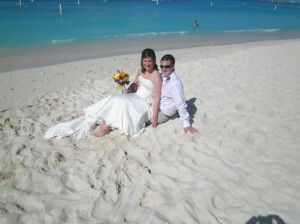 So begins a very popular wedding ceremony reading which is often requested for a Cayman Island wedding. Over the years this 'reading' has been added to, and subtracted from by my clients. Today I did another lovely cruise wedding on Governor's Beach for a couple from North Carolina, this couple chose the "Happiness in Marriage" reading and I was explaining to them how this reading is very dynamic. My couples do agree on one thing, though "A good marriage must be created...in the art of marriage, the little things are big things. What do you think are the important things in a marriage? A couple of years ago one of my couples added, "It is not expecting the husband to wear a halo or the wife to wear wings." I have kept this in the reading. What would you add to the reading which would have particular importance in your wedding ceremony? This couple pose with the bride's parents, who also have had a successful marriage, they will undoubtedly be able to give sage advice. 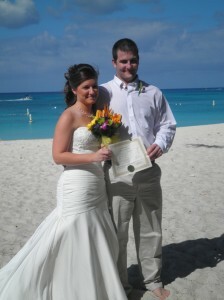 Your wedding ceremony is one of the most important ceremonies you will ever have. Take the time to show your loved one how important pledging your love is, ask us about special meaningful wedding vows, and readings today. Each couple recieves their personalised wedding ceremony script, and decorative marriage certificate with every package, even the 'no frills' basic package. 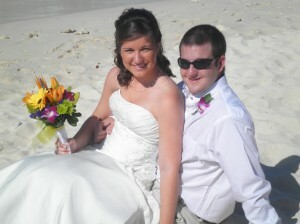 This is a great time to book your Grand Cayman destination wedding. 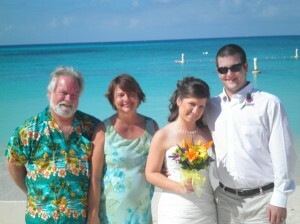 We are now booking through January 2012. We are the company of choice for all types of Cayman Islands weddings, call today to start planning your simple, elegant, personalised wedding (345) 9499933.